This winter I’ve finally done something I’ve been wanting to do for three years. I bought cross-country skis and got myself skiing! I love this sport. 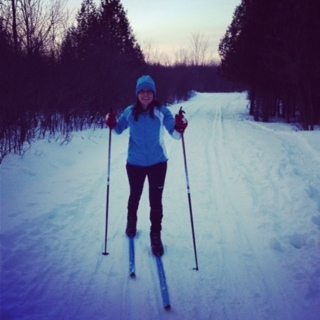 Full-body workout, communing with nature, embracing winter instead of hibernating from it. Well, okay maybe not a full-on embrace of winter. More like a fist bump. I’m not the most graceful. There’s been a lot of clambering along the trails. And few spectacular wipe-outs. Despite elbows and knees flying, I’m having a great time. When I ski I feel…free. Running gives me that same sense of well-being but skiing is harder. It requires a lot more concentration. And coordination. And aside from this sport offering a way to enjoy the winter season (as best can be expected), the health benefits of cross-country skiing are wicked awesome. But more to the point, I’m finally doing something I’ve wanted to do. Thanks to Erin and Darlene who’ve shown me the cross-country skiing ropes and not laughed at my headers… aka wipeouts… that much. “Well, okay maybe not a full-on embrace of winter. More like a fist bump.” HEE HEE HEE. Good for you for getting out there! I keep thinking about cross country and I have no idea why, I’ve never skied in any form but something is calling me.